Representations of monsters and the monstrous are common in medieval art and architecture, from the grotesques in the borders of illuminated manuscripts to the symbol of the "green man", widespread in churches and cathedrals. These mysterious depictions are frequently interpreted as embodying or mitigating the fears symptomatic of a "dark age". 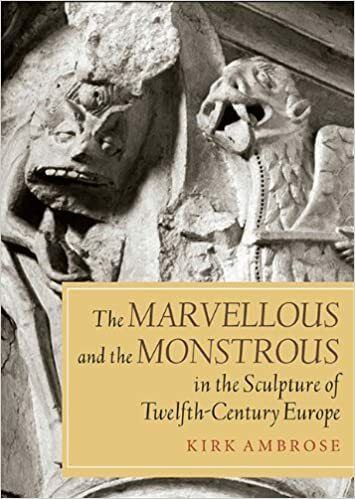 This book, however, considers an alternative scenario: in what ways did monsters in twelfth-century sculpture help audiences envision, perhaps even achieve, various ambitions? Using examples of Romanesque sculpture from across Europe, with a focus on France and northern Portugal, the author suggests that medieval representations of monsters could service ideals, whether intellectual, political, religious, and social, even as they could simultaneously articulate fears; he argues that their material presence energizes works of art in paradoxical, even contradictory ways. In this way, Romanesque monsters resist containment within modern interpretive categories and offer testimony to the density and nuance of the medieval imagination. Kirk Ambrose is Associate Professor & Chair, Department of Art and Art History, University of Colorado Boulder.